Dublin parks feature more than 1,500acres of parkland,with 60 developed parks ranging from wooded natural areas with river frontage to active athletic facilities.Outdoor facilities available for picnics or corporate retreats include pavilions,amphitheaters and shelter houses in Coffman and Scioto parks. Located at 77 N. High St. in Historic Dublin, the Dublin Veterans Park features the Grounds of Remembrance memorial, and is approximately one acre. The park is bordered by the Dublin branch of the Columbus Metropolitan Library, Indian Run Cemetery and Dublin Road. Located northwest of Dublin, this park features a restored 150-acre wetland area, 11 miles of winding trails, and a wind turbine that provides electricity to the park. Visitors can traverse a boardwalk through the wetlands, climb a 25-foot observation tower or visit the outdoor classroom. For more information,visit www.metroparks.net/ParksGlacierRidge.aspx. Outdoor facilities available for picnics or corporate retreats include a pavilion, amphitheaters and shelter houses in Coffman and Scioto parks. For more information, contact the facility reservations staff at 614-410-4550, or visit www.DublinOhioUSA.gov. 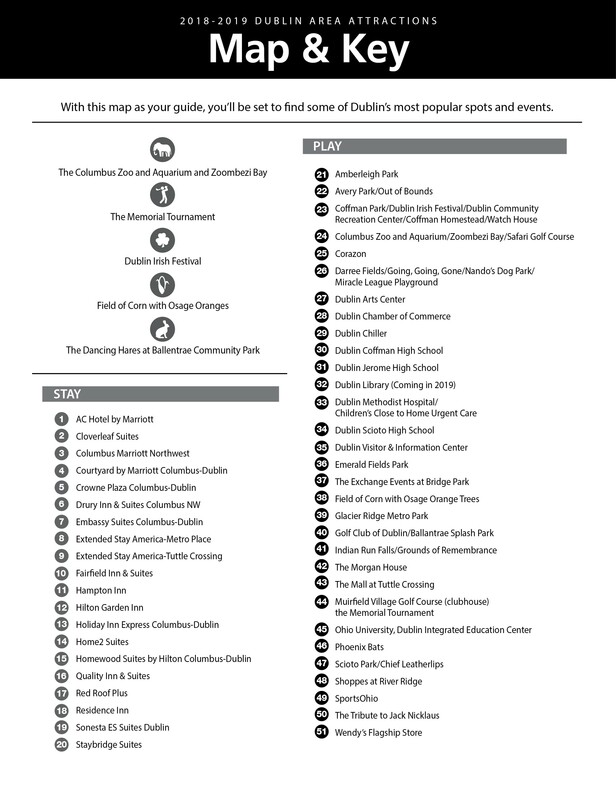 The City of Dublin offers a first-class bike path system with nearly 100+ miles of recreational paths. Motorized vehicles are not permitted on bike paths. 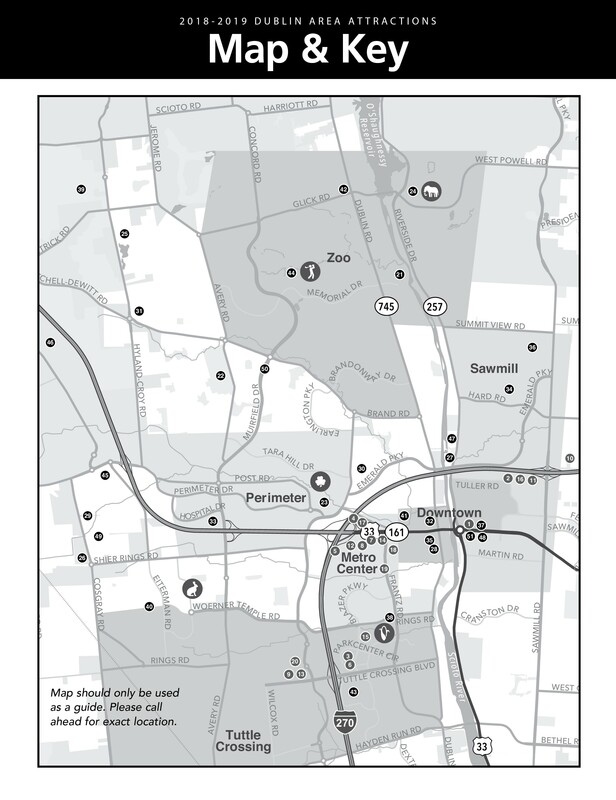 The Chamber office, as well as the Dublin Community Recreation Center, has a map of the bike paths available for reference. Nando’s Dog Park is in Darree Fields Park, located at 6259 Cosgray Road in Dublin, offers small and large breed dogs an area to run, play and roam. The total space is two acres and the large breed area has a walking area for owners. The City of Dublin is rich with attractions, parks and golf courses for residents and visitors alike. Click here to download the map and click here to download the key (pictured below) for your use.